Examining this spookylele gave us a great idea: all instruments should have a "spookified" version. Allow us to explain before thinking we're complete kooks. Instead of solely playing the flute, clarinet, musical triangle, or guitar you can play frightening flutes, creepy clarinets, mysterious musical triangles, and ghostly guitars. Essentially, they'll be the same as their "unspooky" musical counterparts except they would feature supernatural elements, like a skull belly and eyeball turning pegs. Sounds pretty cool, doesn't it? Whether you're a fan of the computer-animated show, Vampirina, or you're completely convinced that "spookified" instruments should be a thing, then this spookylele is exactly what you need. It's the first step to starting a spooky symphony of your own! This officially licensed product features a skeleton-head shaped body with pink sparkly buttons. There's an attached adjustable strap for easy transportation. 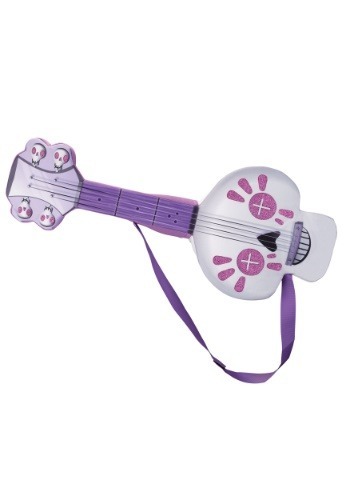 If you want to hear some of your favorite catchy tunes from Vampirina, then just start pressing the buttons and strumming the strings. If you know a young fan of the show Vampirina who wants to dress up as the titular character for Halloween, then gifting them with this accessory is a great idea. Pair this spookylele accessory with any of our Disney Vampirina for a complete and creepy-cool character look.